Waste is just a resource that’s unrecognized. If we all looked at our stuff through this lens, we could have a future without trash cans—one in which everything is designed to be reused or recycled and all materials are too valuable to waste. On Friday, June 13, CUESA organized a Waste Wise tour to the Jepson Prairie Organics composting facility in Vacaville and Eatwell Farm in Dixon. 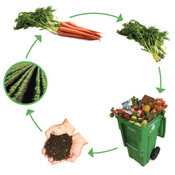 Eatwell uses compost from Jepson Prairie to enrich the soil. Click on the links below to go on a virtual tour with us.